On writing a memoir: It is hard. I stop a lot. I have no context. I am critical of my younger self. If I am, how can I reveal her to others? with compassion? with the love that she did not have for herself? How did I get here? How did I emerge? How did I escape? How did I get out? How am I sane? Sometimes it is all too much and I close the book and walk away. Am I walking away or coming back? Hard to tell. Poetic voice strikes a chord. Stand by with your mallets. If I tell it I am listening, it sounds like distant wind chimes in a sultry summer breeze. a lugubrious oil on the surface of our unruly talents. My mother wrote letters week after week after year after year, first to her mother, my grandmother who saved them from the time she was 17. Later she gave them to me, forty years worth, in a brown paper bag. When she wrote to me, I put them in a drawer unopened. I had spent a fortune in time and money to smooth out the etching of her voice on my grieving heart. The letters remained silent in the drawer for some decades, mixed in with other obsolete detritus, unopened through three name changes. Yesterday I opened the drawer looking for some translucent paper to use as a layer in a collage and I opened one of the letters. It was three pages, written in blue ball point pen. Still I did not read it. I noted the date, October 2010, dutifully inscribed in the upper right hand corner of page one. 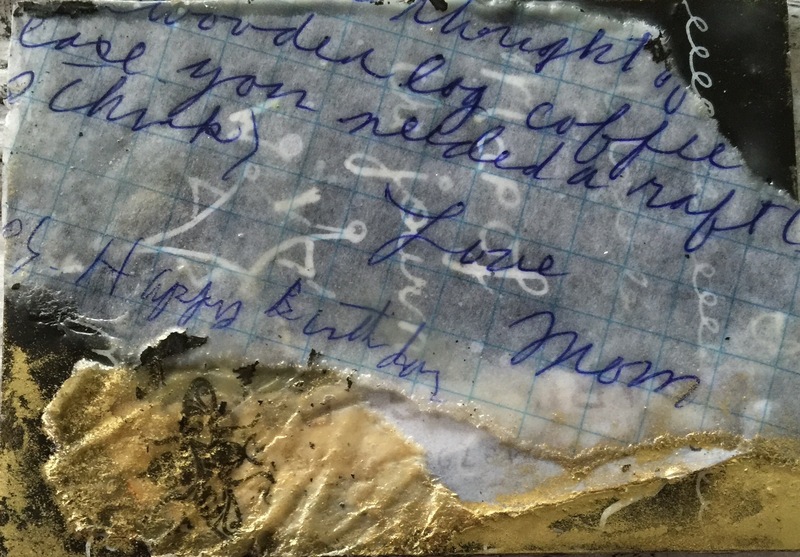 This I tore from the bottom of the page, preserving just these words, and set it on a tiny support, upon which I had melted a couple of layers of hot wax and damar resin combined to make encaustic medium. The hot bee’s wax made the paper beautifully transparent and made the blue ink bleed ever so slightly. I added some more wax to seal it reminding me of the sealing wax that used to be used to close an envelope and identify it’s sender. I had some of that as a child, a gift from a mother’s boyfriend, but alas no pen or paper nor flame to melt it. I left the piece to cool and solidify and then burnished it with my sleeve. as it does, to signal: it is done. Step away and begin another.